mb: From your tests can you tell us in brief how visible are the clipping issues of enlongation? What about engines? Engines (locomotives) are always shorter than 12/8, most of them are still 8/8, so there´s only the usual "glitch" (tunnels, bridges, ramps) to be seen. In fact, there are no additional glitches than normal by those "longer vehicles". This is done by a special handling of vehicle graphics, depending on location on track (they´re split up into "short" vehicles on straight track, and only shown in full length were absolutely needed, i.e when changing direction). Engines (rail cars) could also be as long as an UIC coach (12/8), but don´t have additional glitches as well. Much higher indeed. I like that livery! That one belongs to Toyland! What about a DBT set? Well, the old "DB" (German Federal Railways, until 1994) had a rich assortment of "special" coaches, e.g. for a number of "tourist trains", e.g. "Touropa" (to name another one included in DBXL 0.9), or for those famous "wine tours" along the Rhine and Moselle rivers ("Reblaus-Express", literally "vine fretter express"). 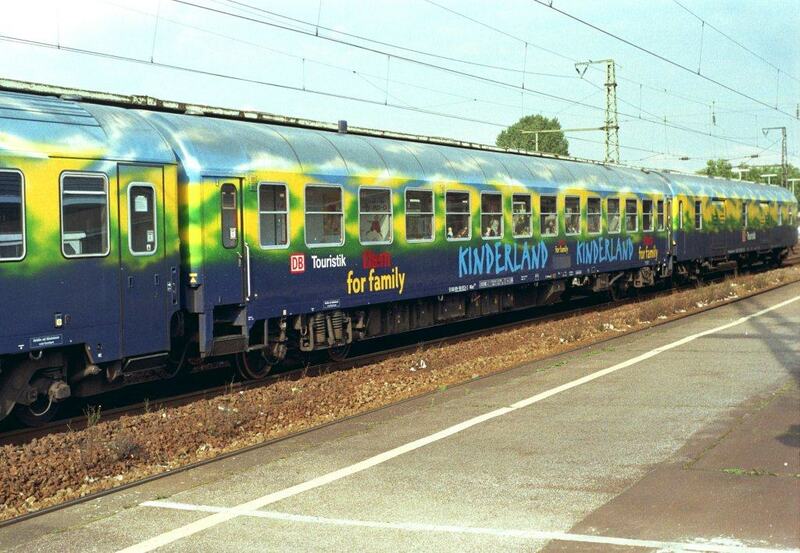 W.r. to "Kinderland" (children´s play area), these were three specially modified express coaches from the early 1980s (type "WRtmh 136"), to make travelling for children more comfortable. Those coaches were divided into an active, a creative and a reading area, each with an adequate outfit, and provided with a children´s carer (o/c, those coaches had only one entry/exit). Good old days... Now its all about money. That only one entrance/exit would be safe for kinder but very dangerous in emergency cases. Whose that stranger lurking on these forums? Good to see that you are alive and well. RL is eating all of us. :o Whose that stranger lurking on these forums? Start with the regular trunk version just to get the feel of it. Then switch over to JGR's patch pack. He's added just about everything that cirdan did with New Map Features plus a lot more.